Here at UKAA we have a good stock of antique Royal Mail pillar boxes for sale. These letter boxes have been fully refurbished here in our workshops and are supplied with the original Chubb locks. For more information, please contact us at the office on 01543 222923. At UKAA we always have in stock a large section of original reclaimed ex Royal Mail pillar boxes which have been fully refurbished by our team of skilled craftsmen. Our Royal Mail Pillar boxes have been sympathetically refurbished to keep as much of the original character as possible, they also come complete with original Chubb lock, keys and their internal cage. We have recently sold an original Elizabethan ERII pillar box to one of our customers in Belgium and as requested we have painted the house number's on the pillar box (as pictured below) in gold. Picture below is our original Royal Mail pillar box before being collected by our shippers, showing the gold lettering on the box. Here at UKAA we are able to ship any of our items all over the world using our experienced and fully insured shippers, we can ship direct to your door or your nearest port. For more information on any of our items that we have for sale or for a worldwide shipping quote please call the office on 01543 222923 or via live chat during office hours. Tags : Pillar Box . Royal Mail . International and World wide delivery . Reclaimed . Antique . Original. Original Royal Mail Pillar Boxes at UKAA. At UKAA we always try and stock a large selection of reclaimed original cast iron Royal Mail pillar boxes that are available to view online or at our reclamation yard in Cannock Wood Staffordshire. We have a broad selection of styles for sale including Victorian (VR), Georgian (GR and GRVI), Edward (ERVII) and also the current Queen Elizabeth ERII boxes. 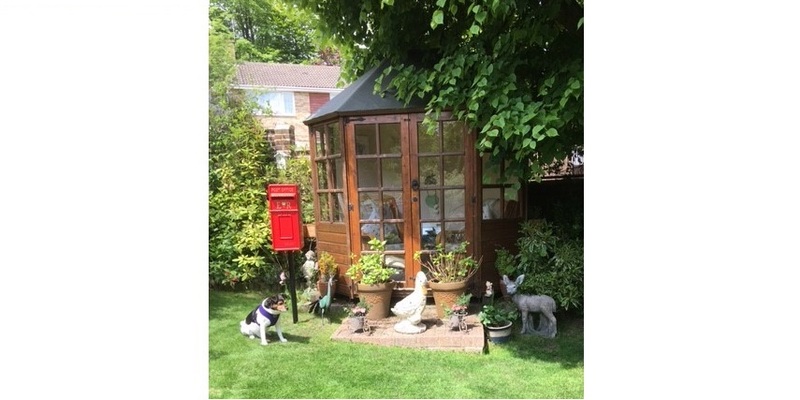 At UKAA we have a small team of skilled workmen that are able to fully refurbish these antique cast iron pillar boxes back to there former glory both inside and out. Where possible we also keep all the original hardware with each individual pillar box including cages collection information and original Chubb locks and keys. We generally as a rule paint the pillar boxes in original Royal Mail Post Office red but we have painted boxes black, gold, white and even pink in the past. The image below is of Viv with a selection of our Royal Mail pillar boxes that we currently have in stock. These are perfect for your wedding day as your something old - many of our customers have used these boxes for their wedding guests to leave notes in on their wedding day. We can paint the lettering on your post box in either Gold or Silver for you at no extra cost. We also offer a hire service for these post boxes - a very unique 'something borrowed'. Here at UKAA we ship our items both near and far, from the city streets of London to down under in Oz! If you would like more information on our shipping services please do not hesitate to contact the team on 01543 222923. At UKAA we always have a large stock of original Royal Mail recalimed pillar boxes for sale. The team at UKAA are able to fully refurbish the pillar boxes back to their former glory. Sometimes for the true collector we also occasionally sell a box that is ready to be restored.